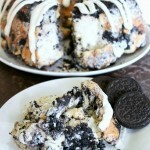 Pina Colada Monkey Bread - Dessert Now, Dinner Later! 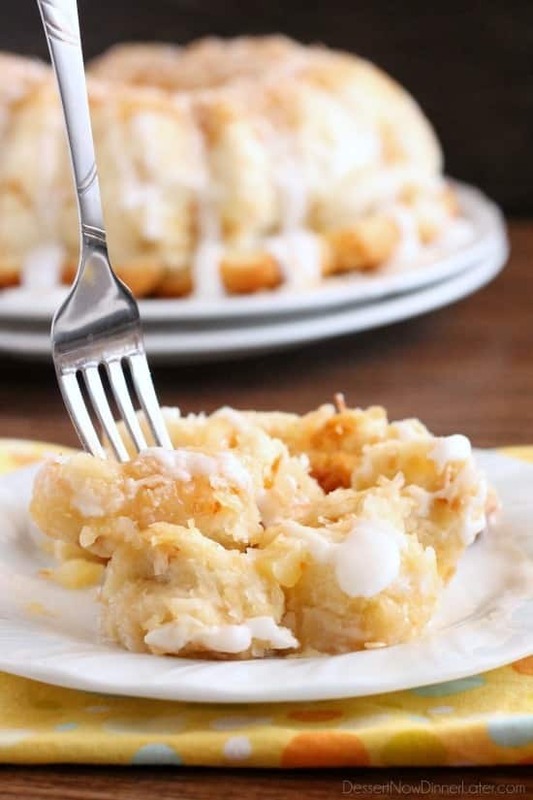 Pina Colada Monkey Bread – toasted coconut, crushed pineapple, and a secret ingredient combine together to make this sticky pull apart bread a tropical treat! I am seriously addicted to coconut creations. 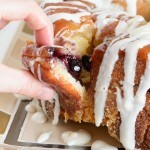 Hence this new one, Pina Colada Monkey Bread! It’s got crushed pineapple, toasted coconut, and my all time favorite unique ingredient: cream of coconut! 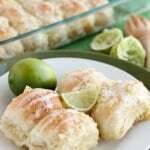 This bread is ridiculously tropical, down to the coconut-y glaze! Basically you use pre-made rolls cut into fourths, toss them in butter, cream of coconut, crushed pineapple, and toasted coconut, layer it up in a pan, bake it, then put more cream of coconut in the glaze (with some rum extract if you want) and drizzle, drizzle, drizzle! 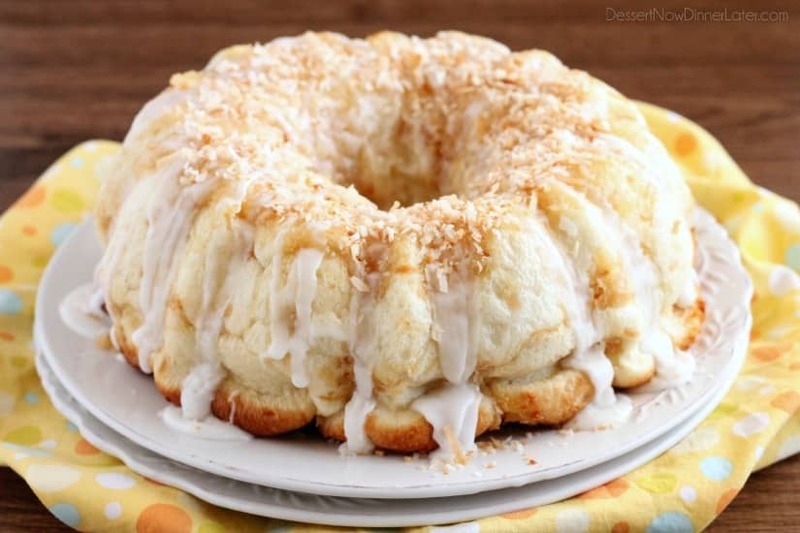 I even save extra toasted coconut for the top to add some crunch to this soft, sticky Pina Colada Monkey Bread. It’s heavenly, and easy. Pretty low maintenance for a monkey bread, since it’s all tossed together! You are going to love this recipe for breakfast or dessert! Head over to the Rhodes Blog to get the details! Toast the coconut on an ungreased baking sheet at 350 degrees Fahrenheit for 3 minutes. Stir it up, and then continue baking and stirring every 30 seconds to 1 minute or until golden brown. Coconut browns and burns quickly, so stay right by the oven and stir it frequently. Allow the toasted coconut to cool. Melt the butter in a large microwave safe bowl, and whisk in the cream of coconut. You may need to whisk it up in the can before you measure it (sometimes it separates with the solid portion on the top and the liquid portion on the bottom.) Add the toasted coconut and crushed pineapple to the butter/cream of coconut mixture and stir it up. Cut each roll into fourths, then toss half of the dough pieces in the coconut/pineapple mixture at a time, so they don’t get squished, and layer the dough into a greased bundt pan. Cover the bundt pan with greased plastic wrap and let the dough rise until it reaches the top of the pan, about 45 minutes to 1 hour. Bake at 350 degrees for 25 to 35 minutes or until the dough pieces are fully baked where they touch each other. You may need to cover the pan with foil so the exposed dough doesn’t brown too much. After it’s done baking, immediately invert the monkey bread from the bundt pan onto a large plate. Mix up a quick glaze with the powdered sugar, cream of coconut, rum extract (optional), and just enough milk to the desired consistency. Then drizzle it over the monkey bread. 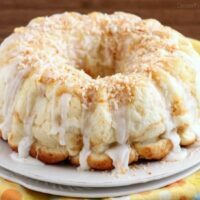 This Pina Colada Monkey Bread is best served warm from the oven with a little bit of extra toasted coconut on top! Notes: You can alternately dip each piece of dough in the butter/cream of coconut mixture, roll it in the toasted coconut, and then layer the dough and crushed pineapple in a greased bundt pan for a slightly different look and texture. Be sure to pour any extra butter/cream of coconut liquid over the dough before you let it rise and bake. Store leftover cream of coconut in the refrigerator and use for smoothies or something else. Store any leftover monkey bread covered in the refrigerator up to 5 days. This looks so wonderful, Amber. Great Mother’s Day idea. Thanks Teresa, you’re so sweet! So, I need to jump on the monkey bread train. I’ve never had it. Some many wonderful bloggers and friends rave about how insane it is, but I’ve had yet to try it. Coconut, pineapple, pastry…I’m in. Seriously?! You better get on that girl! 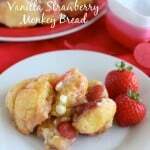 Monkey bread is awesome! I love monkey bread and pina colada! This is such a fun idea, Amber. Heading over to check out the recipe! Thanks Danielle! It was fun to make and equally delicious! 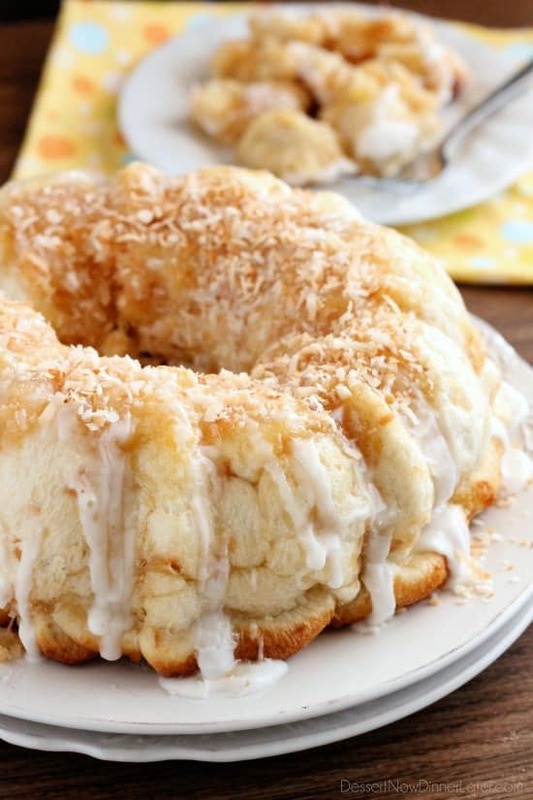 I am obsessed with anything coconut too so this monkey bread is totally calling my name! It looks so incredible, Amber! I had a feeling you liked coconut. 😉 Thanks Kelly! Ooooh this sounds SO good! I looooove cream of coconut so I love that that’s the secret ingredient! And crushed pineapple is the best thing ever, too! Sounds like you would enjoy this recipe! Thanks Jess!